About 75% of American taxpayers overpaid on taxes in tax year 2016, according to IRS data. And though they may have been overjoyed to get a handsome tax refund, this scenario means they are simply being reimbursed for money they’ve lent the government. 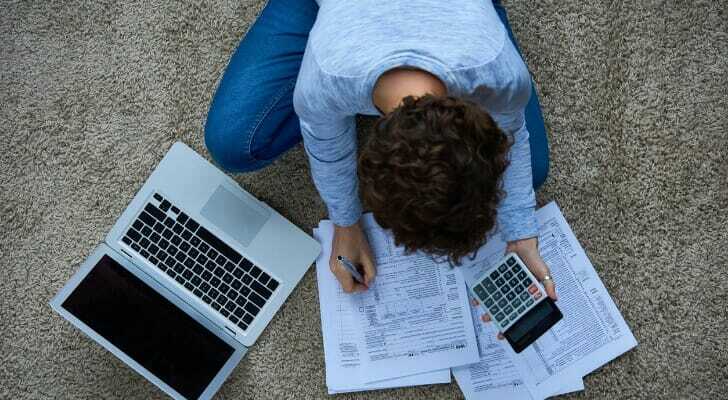 This tax season, whether or not an individual has a windfall on the way depends on his or her tax-planning savvy, but residents of certain states overpay more on their taxes and thus get higher refunds. In order to rank the states with the largest average tax refund, we examined data on two factors. Specifically, we looked at the total number of returns with overpayments and compared it to the total amount overpaid. Check out our data and methodology below to see where we got our data and how we put it together to create our final rankings. This is the 2019 version of this study. Check out the 2018 version here. $3,163 That is the average tax refund for Americans who overpaid on their taxes. On average Americans do not withhold enough on their taxes. Three-quarters of Americans are refunded while only 19% of taxpayers end up owing money to the IRS come tax time. Northeast pays high taxes and receives large refunds Four of the top seven states on our list are in the Northeast. These states tend to have higher-than-average income taxes, which may be why taxpayers there receive larger tax refunds. Connecticut tops the ranking as the state with the highest average tax refund. This state piles on an additional income tax rate between 3% and 6.99%. This state also has an average effective property tax rate of 1.97%. In total, about 1.3 million Connecticut taxpayers received a tax refund, according to IRS data, worth a total of about $5 billion. On average, that leaves the average tax refund here at $3,844. New York is another state with a fairly progressive income tax rate. Residents who live in the city of New York must also contend with an additional city tax on top of the state and federal income taxes. Our analysis of IRS data shows about 7.2 million New Yorkers received a tax refund and, on average, received a tax refund equal to slightly less than $3,800. The Cowboy State is a fairly small state population-wise, and 202,160 taxpayers received a refund according to our latest numbers. But that figure also represents just under 81% of all tax returns, an above average figure. IRS data suggests that those 202,160 Wyoming taxpayers overpaid by $3,784 on average. A tax refund of nearly $3,800 would make a nice sum to invest or place in a high-yield savings account. Massachusetts levies a flat income tax rate of 5.1% on its citizens. That means whether you are a high-earner or a low-earner, you can expect 5.1% of your income to go to the state government. The statewide sales tax is on the low side, which offers some respite to taxpayers stretched thin. IRS data reveals that, on average, the average taxpayer who overpaid on taxes received a tax refund equal to $3,477 in the Bay State. Income taxes in California range from 1% to 13.3% based on your income. Sales taxes too are high, ranging from 7.35% to 10.25% depending on where you are purchasing your goods. The good news for taxpayers here is tax refunds are common and sizeable. More than 72% of taxpayers saw some kind of tax refund and, on average, received $3,439. They say everything is bigger in Texas. If stretched for evidence to support the claim, residents here can point to their tax refunds. According to IRS data, the average tax refund in Texas fell just short of the average tax refund in California. We estimate that about 9.5 million tax-paying Texans received an average tax refund of $3,435. The Garden State has a progressive income tax rate and one of the highest property taxes in the country. Taxpayers here, according to IRS data, are also used to overpaying on their taxes. On average, taxpayers in New Jersey overpay by about $3,407. Around 77% of taxpayers overpay, slightly above the national rate. The average tax refund in Washington, D.C. was just under $3,400. In total, about 253,000 people received a tax refund here. Unfortunately, $3,400 may make less of a dent in a typical taxpayer’s expenses, given that the nation’s capital has one of the highest costs of living in the country. The average rental in D.C. costs more than $1,400 per month. The average Louisiana taxpayer who overpaid taxes received a refund of $3,367, IRS data shows. That is the ninth-highest average refund in the country. Nearly 83% of Louisiana taxpayers received a tax refund, one of the highest rates in the study. In total, Louisiana taxpayers received $5.2 billion in overpaid taxes. The average taxpayer in the Sunshine State who overpaid on taxes received a tax refund of $3,333. More than 7.3 million taxpayers paid too much in taxes, and the IRS returned $24.4 billion back to Florida. That’s a good chunk of change Florida residents could put to work in retirement or brokerage accounts. Total number of refunds issued. This is the number of federal individual income tax refunds. Data comes from the IRS and is for fiscal year 2017. Total amount of money issued in refunds. This is the sum of all money issued in federal individual tax refunds. Data comes from the IRS and is for fiscal year 2017. To rank the states, we divided the total amount of money refunded by the number of refunds issued. This gave us the average income tax refund per state. We then ranked the states from highest average income tax refund to lowest. Save your tax refund It’s healthy to think of your tax refund as money the government has been saving for you. Once you receive your tax refund, if you simply invest it or place it in a high-yield saving account, you can painlessly increase your savings rate. Of course, this is not the best course of action if you have expensive short-term debt. If you have credit card debt, for instance, and receive a tax refund, the refund should go toward paying down that debt. Talk to an expert If you are not sure what you need to do to make sure your savings and investments will keep you going into the future, why not make a plan with a financial advisor. A financial advisor can make sure you are saving enough or advise you on strategies to increase your investment portfolios. If you are not sure where to find a financial advisor, check out SmartAsset’s financial advisor matching tool. It will match you with up to three local financial advisors who fit your needs. 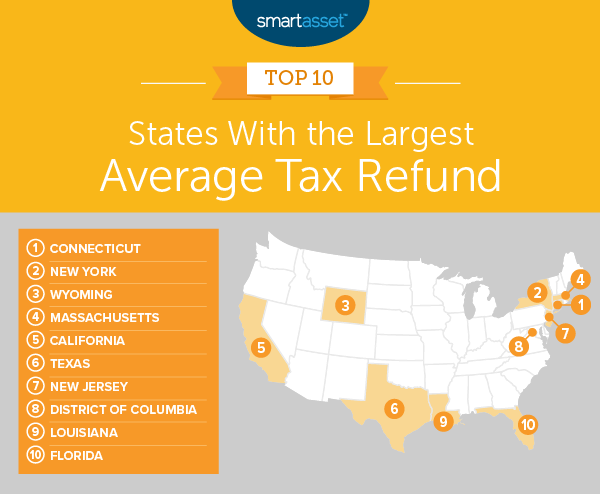 The post States With the Highest Average Tax Refund 2019 Edition appeared first on SmartAsset Blog.